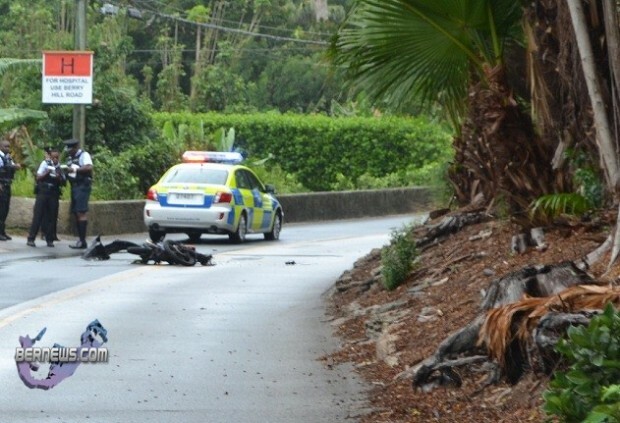 [Updated] At approximately 10/10:30 this morning [June 13] emergency service personnel attended an accident on South Shore Road in Devonshire, just east of Tee Street junction. We unofficially understand that the bike may have slid out on the wet roads and collided with the Police car. Traffic flow is being diverted over Tee Street at this time. We will update with official information as able. Get um anyway you can BPS……. The information given in this incident is misleading. You stated “It appears that both vehicles were traveling along South Road when they collided; however neither the officer driving the police car or the motorcyclist, a 25 year old Paget man, was injured.” To set the recored straight the vehicles did not collide. The rider of the bike slid out due to wet roads, and vehicles in front of him stopping short. As a result of this the bike landed in the middle of the street. The police car which was travelling in the opposite direction, did not break in time and ran over the bike. We didn’t state that, as indicated above its a direct quote from a Police spokesman. If you feel the official statement is in error, the Police would be the ones to speak to about it. Thanks for the heads up, I’m just glad that I have corrected the misinformation given!